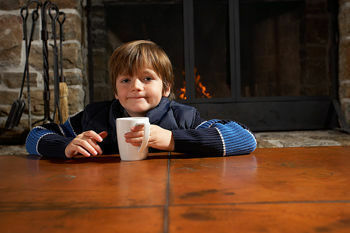 Relax over cocoa by the fireplace in Bachelor's favorite space, the resort's Great Room. 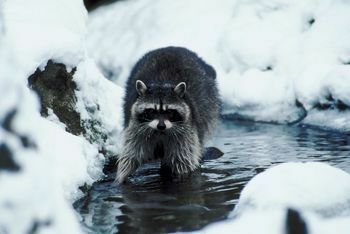 Raccoons can be spotted in winter around the scenic grounds. When there’s snow in Colorado, having Bachelor the golden lab reclining by the grand fireplace makes the Ritz-Carlton Bachelor Gulch the ultimate in luxury and warmth for a family snowsports vacation. As you drive up the valley to Beaver Creek, you will pass the cutoff for Bachelor Gulch, which actually sits on the hill just above Avon. Let’s be clear, however – for the visitor, the Ritz-Carlton, Bachelor Gulch is the only destination. There are condos and timeshares managed by the Ritz-Carlton, Bachelor Gulch Club, but the single five-star hotel facility is this stunning log structure built in the tradition of the great national park lodges of the West. While isolation has its charms, currently there are not many restaurants or shops outside the Ritz. Within the hotel are several eateries, including a branch of the Hollywood favorite — Wolfgang Puck’s Spago — plus a cigar bar; pool bar for summer; Buffalo which serves locally sourced all-American cuisine; and some other bars. Gourmet s’more kits are sold to guests at the main fireplace. The skiing and ski school really center around Beaver Creek, which is a short ski or, at certain times of year when there’s not enough snow to operate the chairlift, a complimentary 10-minute shuttle bus ride away. Your lift pass is a Beaver Creek pass, but also works wonders at Vail, accessible via another free 30-minute shuttle bus ride. For an evening of family excitement on Vail’s Adventure Ridge, this is a great bonus. Rooms and public spaces have just emerged from a $15 million renovation to preserve their national parks feel and add a more contemporary design element to enhance their “mountain elegance.” Now Ritz-Carlton’s AAA five-diamond lodge is all high style with an edgy Westernality – there’s a parlor room that’s a museum of fly fishing. Like the best of the park lodge Great Rooms, the towering wall of windows opposite the huge rock fireplace allows the slopes to flood in, dwarfing the clubby, leather furnishings and hunting-style lobby décor. Only the presence of the amiable golden Lab, Bachelor, whose water bowl and bed were present when he wasn’t, competed with the view. We must note that, however striking, the view is strangely marred by the looming machinery of the Bachelor Gulch chairlift which the hotel and its many high-end timeshare units are – very unfortunately – centered around. Love the convenience, hate the machinery. Most of the hotel’s 237 rooms enjoy a valley view as it’s beautifully situated on the shoulder of the mountain. Guest rooms are spacious and ultra-elegant with myriad amenities such as enormous robes and fluffy towels astride a huge marble bathtub; separate enclosed shower and toilet stalls; the private-label bottled water; two phones plus a cordless one; TV with Internet access; pillow-top mattresses and Frette linens, valley or mountain views and more; some rooms connect and some even have fireplaces or window seats. A bath butler is available to draw any of several specialty mineral baths to soothe those aching bones. The warm and wonderful outdoor pool is equally luxurious, large and beautifully situated in a fieldstone deck just beyond the Great Room. But in a seeming design misstep, the pool’s locker rooms are one floor down, so that you’ll have to walk through the lobby in your monogrammed bathrobe or wet bathing suit to get to the pool. Downstairs, the award-winning 21,000-squre-foot Spa is very attractive but also poorly laid out to accommodate 19 treatment rooms and pilates and yoga studios. The spa’s real highpoint is the Grotto – a soothingly dark, stone-walled cave with plumes of water tumbling down its sides and lounge chairs for relaxation. This area enchants children and families, who wander through because of the pool locker rooms next door, but is, in fact, not officially open to those under 16. At Ritz-Carlton, Bachelor Gulch, superior service is available to young and adult skiers. Tired of the maniacal morning sprint to get the kids to ski school? Utilize the Ritz-Carlton, Bachelor Gulch Ski Nanny, who will come to your room, get the kids dressed, and accompany them on the bus to Beaver Creek and the ski school. At day’s end, the Nanny will also return the kids to your room or the Ritz Kidz supervised program. The Ritz Kidz program serves non-skiing guests 5 to12-years old on a full-day or half-day basis, with outdoor hikes, swimming, local field trips and playtime with Bachelor the dog. Private babysitters are available upon request. More autonomous guests will enjoy the ski valet, who will deliver and receive equipment each day near the chairlift just outside the lodge, or from guests returning from the Beaver Creek or Vail shuttle bus stop. From the top of the Bachelor Gulch Express lift (the one run was closed at our Easter visit), you can ski back down or along the ridge and over into Beaver Creek, where the joys of that mountain await you. At day’s end, snow cover permitting, you can ski back and down to your condo or the main lodge. And the food? Quite good, but after many other fine Ritz-Carlton, Bachelor Gulch experiences, we found the service staff to be shockingly poor. Since both mountain resorts are owned and operated by the Vail Ski Corporation, they both offer a major bonus – complimentary Mountain Guides on staff to lead intermediate and expert level skiers and boarders on 90-minute guided tours each morning. Both mountains also have terrain parks and ski/ride “adventure zones” for kids but our son, Regan, claims the terrain parks are better at Beaver Creek! Overall, it’s not a cheap getaway but the decor and amenities are really posh. However, keep in mind that the scenic location is very much dependent on snow cover so you may end up taking a half-hour shuttle to the chairlifts when, for the same price, you could have chosen another hotel right at the main base.